The better discount men's wig features an elastic band for a comfortable and secure fit to almost any head size. Wig is available in Light Chestnut Brown, Light Golden Brown, Medium Brown, and Medium Reddish Brown. 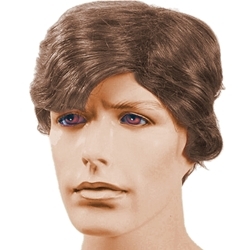 The better discount men's wig is an affordable theatrical quality wig that can be used for most male characters. The wig is made of synthetic fibers.